BODYTRAFFIC in Barak Marshall's “And at midnight, the green bride floated through the village square…”, courtesy of BODYTRAFFIC website. The Ogden Symphony Ballet Association (OSBA) kicked off their new Dance Series last Friday with a performance by L.A.-based BODYTRAFFIC. Rounding out OSBA’s annual presentations of Ballet West and the Utah Symphony, the new series will also feature Collage Dance Collective and Parsons Dance in early 2018. An aptly long-titled work by Barak Marshall opened the program: “And at midnight, the green bride floated through the village square…” was as strange and rambling as its name first let on. An exciting initial outburst of unison gesture sequences too quickly dispersed into two of the dancers speaking in fake accents into a microphone, describing specifically, and sexually, the preparation for a fish dish. This became the pattern for the rest of the dance -- captivating gesture bursts which quickly unravelled into narrative interjections that left me confused, rather than intrigued, by their randomness. Every time the dancers re-entered for another round of unison gestures, the repetitive structure of the phrase they returned to, its sharpness (and impeccable togetherness), and the movement motifs themselves complemented the musical structure so well (as noted in the program, the music for the piece was an assemblage of Jewish love songs and hymns in the Yiddish, Ladino, and Yemenite traditions). While the gestures weren’t accompanied by much lower body movement -- just simple side-steps and drops into lunges -- they triggered a kinesthetic involvement. I felt my investment in the dance wander when, one by one, the women were mysteriously “killed” by the men and slid backwards off a bench, and when a woman hopped around with her feet secured to a board. Marshall’s mother, Margalit Oved, is also an artist and the dance is based on a story about her family’s neighbors in Yemen. I would love to know more about this story and how it is woven into the narrative Marshall has constructed; upon my first viewing, its disjointed fragmentation gave an impression of many false endings. Stijn Celis' "Fragile Dwellings", courtesy of BODYTRAFFIC website. Stijn Celis’ “Fragile Dwellings” was a lovely study in serenity, not unlike a dream from start to finish. Clad in all-white, on a hazy stage cut by beams of light, a series of soloists swept, reached, and spiraled fluidly to soaring choral music, and then in silence. A fourth soloist began and then, just as I had the fleeting impression that the structure had become monotonous, the other three appeared as if conjured by my thoughts. 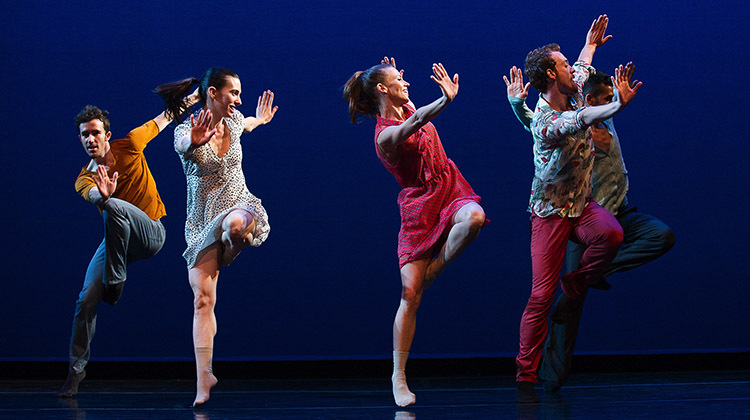 The four dancers wove amongst one another, lightly taking hands and gently partnering. The final image of “Fragile Dwellings”, two watching while another supported Lindsey Matheis in a lush backbend, served to extend the dance’s spectral suspension long past when the curtain fell. Celis, whose name was new to me, showcased an incredible knack for crafting liminal magic with choreographic elements that might seem obvious in another setting. Victor Quijada's "Once again, before you go", courtesy of BODYTRAFFIC website. Until this show, I’d yet to see Victor Quijada’s work performed live. “Once again, before you go” was an excellent formal introduction, as it encapsulated everything I anticipated from the creator of hip-hop/modern dance crossover company RUBBERBANDance. An opening duet for two men was the ideal mashup of contemporary and break dance techniques. I found that the combination of the two also affected my interpretation of the men’s onstage relationship; while in either form, there are expected ways that two males might be presented together (for example, a relationship duet in a contemporary setting and a rivalry in break dancing), the blurring of the two provided a new take on how two men could exist together in performance. 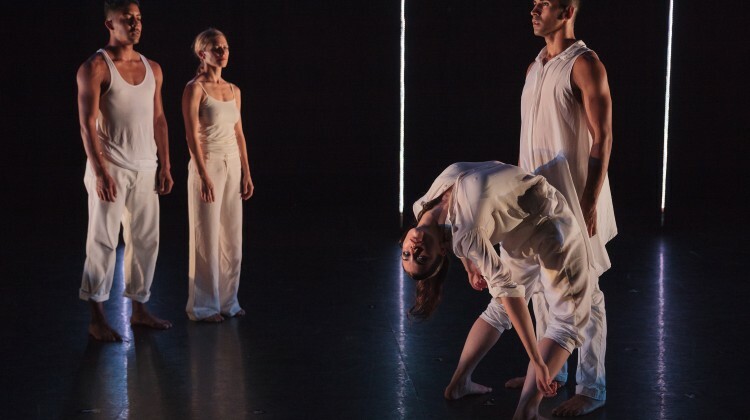 The dancers always had their hands splayed wide: like starfish ready to receive and connect, giving them an air of trepidation mixed with confidence in their transitions from move to move, especially when partnering. I assume this comes from break dancing, hands held out to absorb and anticipate contact with the floor -- it had an intriguing effect transposed to the vertical. At the end of “Once again, before you go,”, a side beam dramatically illuminated a dancer scooped up by two more; she was held aloft for a brief second before the lights cut to black. The image was striking, but its effect was also due to timing: if it had been any other dance you’ve ever seen, the end probably wouldn’t have come for awhile longer. Here, Quijada placed it unexpectedly, and its suddenness was breathtaking. Richard Siegal's "o2Joy", courtesy of BODYTRAFFIC website. BODYTRAFFIC’s program up to this point consisted mostly of “serious dance” -- enjoyable, certainly, but cerebral all the same. Sensibly programmed, “o2Joy” by Richard Siegal closed the show with a gleeful romp set to jazz classics like Ella Fitzgerald’s “All of Me.” Sock slides, a tombé coupé jeté circle, and the spirit of hamming it up all found their places in this finale. A solo lip-syncer elicited many laughs from the audience as he refused to fully exit the stage time after time. As a different sort of mashup, Siegal wove together a fun blend of technical kicks, turns, and partnering with sock-hop-style hip twists and flapping hands. After a bit of meandering, the ending image of “o2joy” was also surprising, as a woman melted at the knees in the hands of her partner. The entire evening was a delight, and so were the exceptional dancers of BODYTRAFFIC. Kudos to the OSBA for the new programmatic endeavor, and I hope it sticks. Looking forward to their spring offerings, and to seeing more Salt Lake folks up at WSU. Amy Falls is the development coordinator at Ballet West, and manages loveDANCEmore’s online journal. If you’re interested in adding your voice to the community conversation by covering a show, please email her at amy@lovedancemore.org.